Every house needs a trusty garden hose, especially during hot summer days, but rolling it out can cause headaches and problems. The same thing goes when you need to store the hose when not in use. Good thing the hose reel is invented, and there are a lot of companies that manufacture the best garden hose reels. Safety: At times, the garden hose is hard to see as it often blends with the grass or the floor. The hose reel ensures that the hazards brought about by the presence of a garden hose is reduced or eliminated. Kink prevention: The hose tends to have kinks when not properly arranged and stored. By using a hose reel, you are guaranteed to have a correctly stored hose in no time. Leak prevention: Storing the garden hose in the reel after every use allows easy observation on the presence of a leak. This will allow not only leak prevention but also water conservation. Organized outdoor: The easiest way to have an organized-looking garden or yard is to use a hose reel. This will help keep your hose well-kept and clean. Convenience: The retractable hose reel will help you to conveniently and quickly roll out or store the hose. This is done in no time and with less effort. Healthy grass growth: The presence of hose lying in the same spot for too long will hamper the growth of grass in your lawn. This is due to the lack of sunlight on the area taken by the hose. By keeping your hose in a hose reel, that problem is eliminated. The Liberty Garden 712 Multi-Directional Garden Hose Reel is a well-made garden hose reel. But is it equipped with features that you might be looking for in a long time? Durable construction: This wall mounted hose reel is made of 18 gauge steel and comes with a rotating carriage. It has a 90-degree solid brass swivel that helps prevent hose damages. It also has brass and galvanized fittings. Weather resistant: Not only does that bronze powder coat finish give the reel a stylish look and appeal, but it also helps protect the product from different conditions due to its weather-resistant feature. Optimum capacity: The hose reel is capable of holding up to 125 feet of 5/8-inch hose with five-feet of leader hose. It also comes with a storage tray for storing your frequently used tools and nozzles. Easy assembly and operation: The product is fully assembled, and all you have to do is attach the handle. Likewise, since it comes with a 360-degree reel rotation, the user will experience effortless unwinding. Simply pull up or release the handle into one of the eight positions to secure the carriage into its proper place. 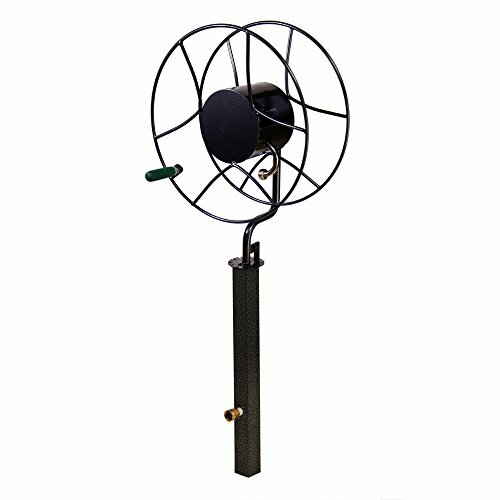 The Yard Butler ISR-360 Free Standing Hose Reel offers an elegant and unique design. This reel will definitely blend well in the beauty of the garden. Easy operations: This hose reel can rotate 360 degrees to make watering the garden and maneuvering the hose a lot easier and enjoyable. There is a nice and dainty handle on the side of the wheel to provide easy winding when the hose is not in use. Sturdy construction: The brass fittings that connect the hose and the pipes are sturdy and robust. The entire product is plastic-free. Although it uses a manual mechanism, it still guarantees and reassures that the complicated parts will not easily break. Optimum capacity: This hose reel can carry and wound a 5/8-inch hose of up to 200 feet. The Suncast Wicker Smart Trak Hose Reel offers a large and automatic hose reel system. This will certainly do the job with minimal effort and more comfort. Optimum capacity: This hose reel comes with an automatic command system and a large storage capacity of 225 feet. User's convenience: It is ready to use and requires only about 15 minutes to unpack, attach, and hook up. The base of the hose reel swivels to ensure effortless unwinding of the hose, and the hose guide will automatically move back and forth while the handle is being turned. Additionally, the upper unit of the hose reel will strongly hinge on the base to allow the housing section to pull to any pointed directions. Hideaway design: The hose reel is placed in a box with a weave pattern design. This way, you can place it anywhere without it being an eyesore. It also helps in the even distribution and smooth functioning of the hose. Hose protection: This product is equipped with a carefully positioned grip that allows easy winding up of the entire hose without frequent bending. 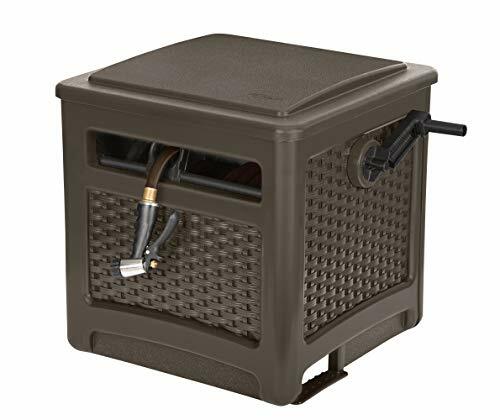 With careful comparison, the Liberty Garden 712 Multi-Directional Garden Hose Reel stands out among the rest. This wall mounted hose reel will definitely look nice and elegant in your garden while doing its task of keeping your hose in place. The durable and weather resistant construction of this hose reel ensures less maintenance and more performance for an extended period of time. Also, its simple installation and easy operation will guarantee a more enjoyable time watering your garden. 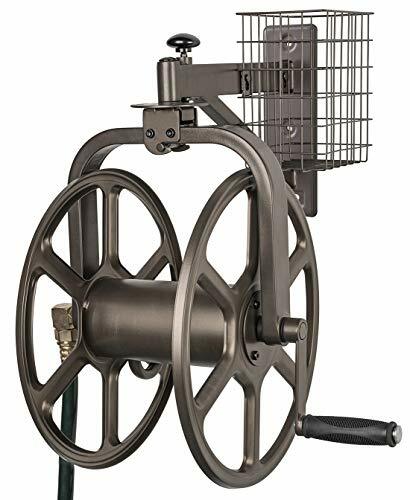 All of those amazing features and more that you’ll get at a very reasonable price truly make the Liberty Garden 712 Multi-Directional Garden Hose Reel a great value for your money!